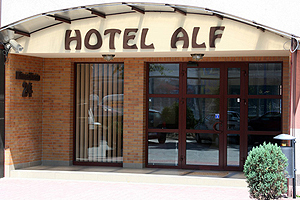 If you are planning to see the royal city of Krakow and looking for cheap yet comfortable accommodation we are gladly inviting you to Hotel*ALF. (salt mine Wieliczka, Oœwiêcim, winter tourist resort Zakopane). We are pleased to invite you to our restaurant – aperitif bar where you can taste delicious Polish and international cuisine, and enjoy nice décor, romantic music and guest friendly, professional staff. If you wish we can arrange business meetings, anniversary and occasional parties, business banquets, family dinners for you. The hotel accepts the following credit cards: Diners Club, Eurocard, Visa Card, Masters Card, Polcard, JCB, PBK. The hotel is situated near the city center ( 5 km away from the main railway and bus station of Krakow ). - from the bus/tram station at Basztowa Street with the tram No. 3or 13 to the Powstañców Wielkopolskich stop, from this place one more stop with each bus to “Szklarska”.